Minutes from O'Hare International Airport, Hotel Indigo Chicago-Schaumburg North provides convenient access to downtown Chicago by car or rail. 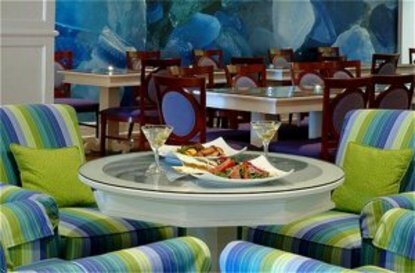 This Schaumburg hotel offers breathtaking decor, an inviting lobby & social areas to relax, a quick service bistro and fresh & modern meeting rooms for your business or social event. Hotel Indigo is pet friendly.Located in Chicago's northwestern suburbs, the hotel is opposite Arlington Park Race Track and minutes from Schaumburg attractions including Woodfield Shopping Center, Medieval Times, Long Grove and IKEA. Hotel Indigo Chicago-Schaumburg North is proud to welcome guests from area businesses including Northrop Grumman, Motorola, Weber Stephens, IBM, Panasonic, Robert Bosch, and Schneider Electric. We are just minutes from the Schaumburg Convention Center and next door to Cotillion Banquets.Hotel Indigo offers each guest a blend of modern contemporary living with the best in traditional hotel hospitality. Curl up in our over sized beds with plush bedding, duvets with covers, pillow shams, dust ruffles and plenty of fluffy pillows. Find comfort in our thoughtful touches including hardwood floors with area rugs, a spa-inspired bath experience, deluxe Aveda products and complimentary high-speed Internet & local telephone calls. Our hotel is your oasis, an escape from your hectic travel pace. This hotel is committed to providing accessible facilities under the American Disabilities Act. If your accessibility needs are not met, please contact the Hotel Manager on Duty. Should you require additional information regarding accessible facilities for guests with disabilities, please call 1-800-Holiday (U.S. and Canada) or contact the hotel directly. For the hearing impaired, TDD service is available at 1-800-238-5544 within the U.S. and Canada.